Collaborative palletizing cell (CCPS). A machine, with which the company from Burgos aims to revolutionize the industrial robotics sector, by being able to work together with people without the need for a perimeter fence. Robots are a key element of industry 4.0, they provide answers, with new production methods, to the main issues of our times. 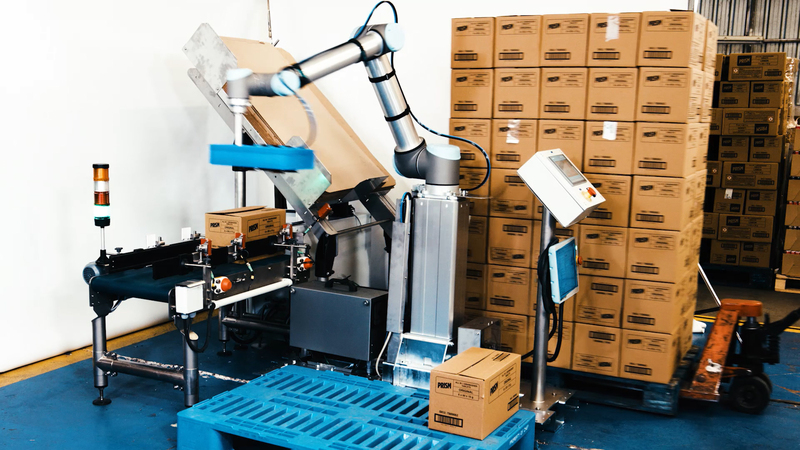 Collaborative robots represent a new era in industrial robotics. They are light, flexible and easy to install; but their main virtue is that they are apt to work together with people, since they have security integrated as their own functionality. They cooperate with the operator to let him perform the tasks he performs best, avoiding dangerous, dirty or noisy jobs. Characteristics that represent a great advance in the improvement of competitiveness. Despite its short life, the model proposed by Sinterpack has already been awarded the 2017 FAE innovation prize and the company is already working on the development of new collaborative packaging systems. This time using a claw similar to that of his older brother, but with the UR-5 robot, smaller and with less load capacity.